Consecrated in 1802 by the first American Episcopal bishop, the Rev. Thomas John Claggett, Zion was the first church—indeed, the first nonresidential building–in the Sugarloaf Mountain region of southern Frederick County, three decades before the village of Urbana was founded and named by Charles Johnson. For 160 years it was the center of community life in Urbana. It is the resting place of many leading citizens of Frederick County, including veterans of the American Revolution, War of 1812 and Civil War. Among the graves are two Virginian Confederate cavalry officers, one killed at the Battle of Monocacy and the other in a skirmish following it in Urbana in 1864. Zion was also used as a hospital during the Civil War. One of its early ministers founded a prominent girls’ boarding school housed in the nearby mansion Landon. Among the notables buried at Zion are the founder of Urbana, Charles Johnson, and his father, Roger Johnson, a noted Maryland industrialist of the Federal period and brother of Gov. Thomas Johnson. Also buried there are members of such early families as Worthington, Beall, Murdoch, Delaplaine and Simmons. 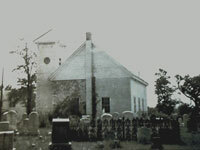 In 1958, when the church was still in regular use, Zion parishioners planned a restoration such as is now underway. They intended to remove the Victorian additions of the 1880s, taking the structure back to its 1802 design. But a 1961 church fire dashed their plan. A restored Zion Church and grounds will be available for a variety of uses, including small community meetings, exhibits about local history, garden and craft festivals, weddings, and non-sectarian services (for example, on Thanksgiving or Memorial Day).